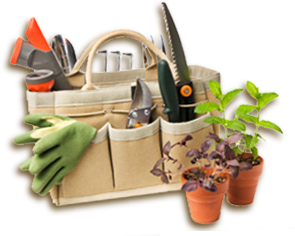 Gardening in containers is a very popular activity and some of the combinations that gardeners create are truly breathtaking. Regardless if you are a beginner or a container gardening fanatic most containers are built around a design technique that is known simply as Spiller, Filler, and Thriller. 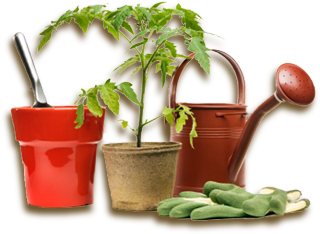 When you combine plants that fit each of these categories you’ll be able to grow your own great containers! Spillers are the trailing plants that cover and cascade over the edge of your container. 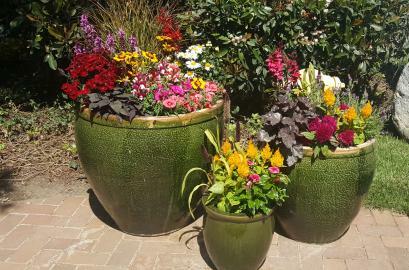 They are typically planted close to the edge of the pot and if you intend to have the pot be visible from all sides then you need to be sure you have spillers that are all around the container. Of course, if your container is going to be up against a wall you would only need to add your spillers to the front of the pot. Now I am sure that every gardener has their favorite container spillers my personal “go-to” spillers are Bidens, Petunias, Calibrachoa, Lobelia, Sweet Potato Vine, Nasturtium, and Sweet Alyssum. A filler plant is placed in front of the container centerpiece also known as the thriller and behind the spillers that grow at the container’s edge. As the gardening season unfolds they will spread in a circular or mounding fashion and will make the container look full. Fillers should provide a contrast in color and leaf texture to your thriller in order to make the thriller stand out and be the focus of your container. 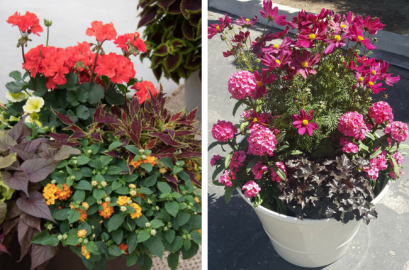 Some of my favorite fillers include Dusty Miller, Begonias, Coleus, Euphorbia, Lantana, Marigolds, Pentas, Phlox, and Zinnias. Thrillers are the “drama queens” of a container. They are plants with height and they beg to be the center of attention. They add not only alluring color with their blooms but also add a textural contrast with their leaves. That’s right, thrillers can not only be flowers but foliage plants or even ornamental grasses as well. These plants are placed either in the center of the container if they will be visible from all sides or in the back of the pot if the container is going to be up against a wall and visible from only one direction. There are a multitude of potential candidates for you to choose from but my favorite thrillers include Agapanthus, Cannas, Purple Fountain Grass, Ornamental Millet, Dahlias, Elephant Ears, and Caladiums. Believe me, if you follow this recipe you’re going to have containers that are the envy of your friends and neighbors! I’m sure you have some of your own favorite container combinations so please share them with us on our Facebook page.